Just TRASH It! | Press - What They Say About Us! I wanted you to see the letter I sent to the directors in my 11 centers. I'm very impressed by you and your business. I will pass your info on to other Sylvans in our co-op. You do a great job. I appreciate it. In my mail at home today I received a very nice thank you card from "Just Trash It", the trash removal people we used for E. Cobb and for JB. EVERY time we have called them, the owner is bright and cheerful, eager to help & willingly changed schedules to accommodate our needs. He remembers our names and his team shows up on time. His workers are polite, quick, cheerful, careful and thorough. Would I use him again? You bet. I'm impressed. He has been in business 13 years. I know why. This is a man who takes pride in his business. Just wondering....what would be your center's equivalent gesture to your customers? I very seldom write companies and thank them for their services, but want to take a few minutes to extend my appreciation to you. My name is Tom Bang and my wife and I could not be happier with your services and the immense help that you have been for us. I have never met a nicer group of men who not only worked hard, but never complained or acted like the enormity of the job at hand was too much for them. They were all very professional and polite and did us a great favor at a very fair price. I will use your name in the future to friends and family who might have a need for your service. justTRASHit is proud to work with local companies, municipalities and causes to help them in their endeavors. We're been written up for charitable work, for Business of the Year and for our work on Earth Day. We're coveted experts and have been on Atlanta Business Radio and on TLC's "Hoarding : Buried Alive!" Check out video of us removing a piano on Trust Dale. TDTV Sea 02 Ep 64, Airdate: 12/04/2011 Part 3 from TrustDale Team on Vimeo. Just Trash It was selected to provide removal services for multiple governmental entities in 2011 and 2012, winning contracts because of their willingness to work at times other companies would not and commit to recycling to meet federal mandates. The Kiwanis Club of Dunwoody hosted the Soap Box Derby and justTRASHit was chosen to sponsor one of the cars. The Jamaican themed car was driven by 11 year old Trent Raburn and was built by his grandfather & dad who are both 1st and 2nd generation soap box derby racers. 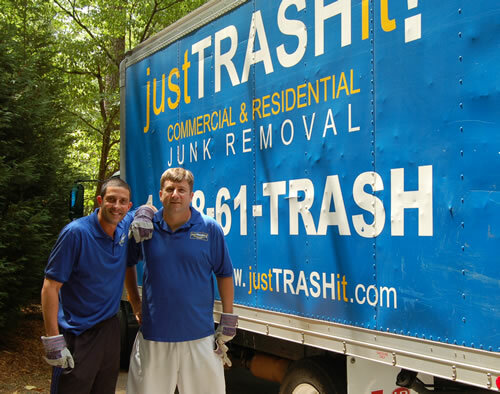 They chose justTRASHit to sponsor their car as they wanted to pick a company that is making an impact in Dunwoody. I felt honored to be chosen especially since Trent won 1st place in the 2009. After a long day of racing, Trent made the finals and came in 3rd place out of 15 drivers. We all are very proud of Trent and he represented justTRASHit like a true champion. We wish him success in 2011 and hope to be part of it again. 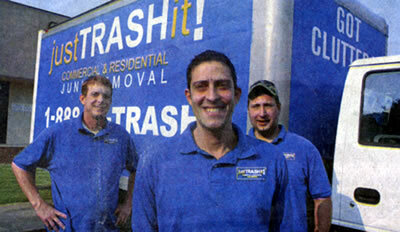 justTRASHit was just featured on TLC (The Learning Channel) March 21st at 10pm - Hoarding: Buried Alive! The episode will be shown again on TLC March 24th Wednesday night at 9pm. Just TRASH It! is featured in video and online coverage by WSB-TV as the cleaning force behind a massive foreclosure clean up in DeKalb County. Just TRASH It! is featured in the business section of the August 8, 2007, Dunwoody Neighbor. Just Trash It! owners, Kevin Copeland and Ryan Tabb, are featured in the Atlanta Journal Constitution Career Center. Find out why Kevin and Ryan love their work! Kevin (left) and Ryan mug for the AJC feature photographer. 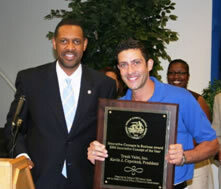 President of justTRASHit!, Kevin Copeland, is again recognized for his DeKalb County award for Innovative Concept of the Year. Trash Valet, the sister company of Just Trash It!, is featured in the business section of The Champion. justTRASHit! and Trash Valet, Inc. president, Kevin Copeland, accepts the 2006 Innovative Concept of the Year Award from DeKalb County Office of Economic Development CEO Vernon Jones. Kevin Copeland, president of justTRASHit!, was awarded the 2006 Innovative Concept of the Year Award by the DeKalb Office of Economic Development on Septiber 12, 2006, for waste rioval concepts practiced by parent company Trash Valet, Inc.
Trash Valet, Inc. has been servicing apartments and condominiums since 1997 by providing door-to-door garbage pickup. Normally, residents in these communities have to haul their own garbage on top of their car to a centralized trash compactor. In addition to household waste, Trash Valet, Inc. also hauls away large, bulky itis from garages, basients and storage spaces. Let us take away your old furniture, sofa, mattress, box springs, bed, dresser, desk, table, chairs, entertainment center, cabinets, appliances, refrigerator, washer, dryer, stove, dishwasher, water heater, ac unit, carpet, construction debris, lumber, wood, drywall, renovation debris, remodeling, yard debris, branches, electronics, stereo, computer, monitor, tv, scrap metal, filing cabinet, copiers, household garbage, hot tub, trampoline, office equipment, cubicles, tires and more. We haul away from basements, garages, attics, offices, foreclosures, evictions, storage spaces, restaurants and warehouses. We are environment friendly! We only dispose of waste at state-approved landfill sites/transfer stations, and recycle whenever possible. Dunwoody owned and operated since 1997. Atlanta junk removal available for the following cities in GA (bold means we're doing LOTS of business in your area! ): Dunwoody, Sandy Springs, Marietta, Buckhead, Roswell, Alpharetta, Duluth, Buford, Norcross, Lilburn, Decatur, Smyrna, Tucker, Doraville, Chamblee, Lawrenceville, Vinings, Suwanee, Brookhaven, Peachtree, Clarkston, Stone Mountain, Woodstock, Kennesaw, Midtown, Virginia Highlands, Acworth, Snellville, Johns Creek, Cobb County, Dekalb County, Fulton County & Gwinnett County.